It’s one of the strangest songs of the 70’s, but it’s no prog rock freakout, no barbed Frank Zappa commentary, no underground outsider art music. Rather, it’s a mellifluous tune, bathed in sweet harmonies, strings and horns a la Burt Bacharach. It’s the juxtaposition of the lyrics- a repetition of the phrase “you don’t care”- when paired with the musical backing, that makes the song so unsettling, so weird. 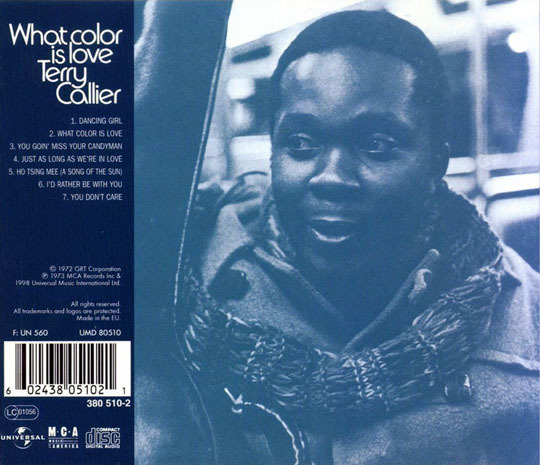 “You Don’t Care”, Terry Callier’s subtly chilling love song to apathy, is found on his 1972 album What Color is Love. It was Callier’s third album, finding him moving further from his acoustic folk and blues roots into jazzier soul territory. Beneath the striking cover photo (by Joel Brodsky, known for his portraits of Jim Morrison) lie a collection of songs dealing with the struggles and poverty of inner city life, as well as the joys of love. When we get to “You Don’t Care”, which is strategically placed at the very end of the album, it’s almost like Callier is saying “You’ve listened to the whole album, but you don’t care, do you?” Adding a further twist is that he doesn’t even sing on the track. Instead, a trio of backing singers – Shirley Wahls, Kitty Haywood, and Vivian Harrell- provide the hypnotic, smooth and bittersweet chorus intoning “you don’t care / you don’t care / la la la la…” These three women had connections to Callier through the Chicago soul scene and have since become renowned for their contributions to soul and gospel music through their own recordings and with other artists. Are they meant as a “Greek chorus”, a response to Callier? Are they saying he really doesn’t care about the subjects of his songs? Or do we take our cue from the preceding song to the woman he loves, “I’d Rather Be With You”? He’s just poured his heart out to her, but maybe it doesn’t matter because she doesn’t care? This is less likely, as presumably Callier would then be singing the “you don’t care” mantra, rather than the female chorus. Most likely, he’s directing the song at the listener. It seems to be a sad, resigned, jaded declaration that we don’t care about anything he’s sung about in the previous songs – not love or spirituality, not the plight of those in the inner city ghettoes, not even the woman on the album cover, naked on a stained and threadbare chair. Callier gives us no clear explanations. Just an enigmatic song about apathy cloaked in a deceptively light and breezy plastic veil. La la la la…. Interesting. I love your speculation and the possibility the women might be a “Greek chorus.” This also reminds me of Teddy Thompson’s “I Should Get Up” because it’s another good song about apathy. Thanks! I’ll have to check out the Thompson song.